Catalog Page 29. 7” & 10” Patty Bears. Stuffed teddy bears in assorted colors with embroidered eyes. Catalog Page 29. 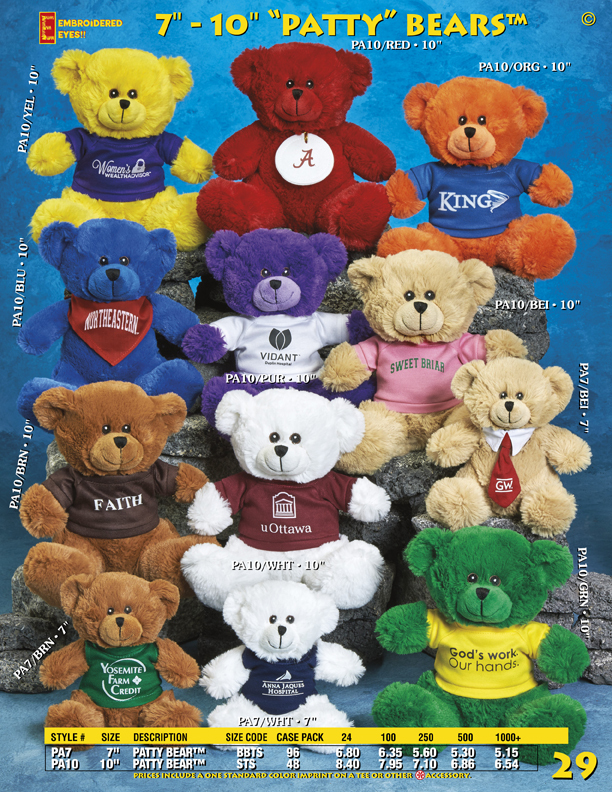 The 7" and 10" Patty Bears are available in a variety of colors. Choose from red, yellow, blue, orange, green, brown, beige, and white colors. These animals include a one-color printed t-shirt, ribbon or bandana. Although we show the amount of bears packed per box, you can order any quantity above 24 pieces. There is no charge to mix and match the animals as well as the shirt colors. The set-up charge is $25.00 per order. These teddy bears have embroidered eyes. Embroidered eyes are becoming increasingly popular for hospitals, dental offices and child care facilities. Look for the Embroidered Eyes emblem to determine if the eyes are embroidered. In addition to bears with t-shirts for sale, we also offer printed accessories including hats, scarves and ribbons. If you order more that 2,000 pieces, we can custom manufacture your teddy bear or stuffed animal. Instead of using a t-shirt, we can embroider your logo. We have over 40 years of experience manufacturing stuffed animals. Send us your design today for a free quote or just choose one of our in-stock designs from our online catalog.